Edgar Allan Poe lived at this address in Baltimore—in what was then the countryside—with his aunt (and later mother-in-law), Maria Clemm, her ailing mother (Elizabeth Cairnes Poe, aged 73), her daughter (Virginia Eliza Clemm, aged 10, later Poe’s wife), and perhaps her son (Henry Clemm, aged 14) for two or three years from about 1832 until 1835 when he moved to Richmond to edit The Southern Literary Messenger. Learn more about visiting the Edgar Allan Poe House National Historic Landmark here. Edgar traveled from this railroad station on several occasions to visit his friend John Pendleton Kennedy in Ellicott’s Mills 1831-32. Edgar moved into his Aunt’s house, Maria Clemm, here upon his return from West Point in 1831. Street name changed to Eastern Avenue by 1859. Poe shares a room with a cousin, Edward Mosher in June 1829. Home of Benjamin Henry Latrobe where on October 7, 1833 John Pendleton Kennedy, Dr. James H. Miller and John Hazelhurst meet to judge the entries for the contest sponsored by the Baltimore Saturday Visiter. Edgar wins the $50 prize for fiction for his story “MS found in a Bottle.” His poem “The Coliseum” is given second place in the poetry contest. The Baltimore Saturday Visiter was a weekly periodical established in 1832 by Charles Cloud and Lambert Wilmer. Poe submitted “MS. Found in a Bottle” as one of many entries to a writing contest offered by the Visiter. Each of the stories was well-liked by the judges but they unanimously chose “MS. Found in a Bottle” as the contest’s winner, earning Poe a $50 prize. The story was then published in the October 19, 1833, issue. 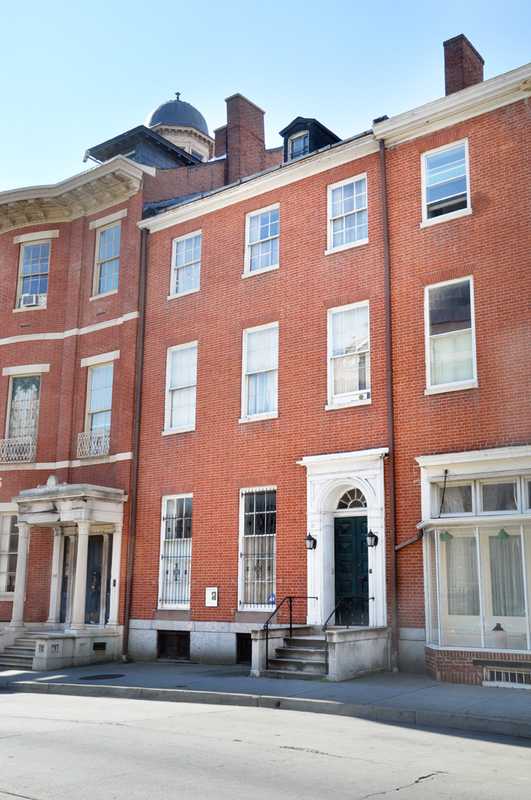 A man named Joseph Walker found a disheveled and disoriented Poe outside this building on October 3, 1849 and was able to extract enough information from him to get the name of an acquaintance, Dr. Joseph Evans Snodgrass who was dispatched to help. Snodgrass arrived with Poe’s uncle, Henry Herring. Snodgrass commented that Poe’s appearance was “repulsive” with unkempt hair, a haggard, unwashed face and “lusterless and vacant” eyes. Westminster Hall, one of the area’s most intriguing architectural landmarks, is a converted Gothic church built on arches above Westminster Burying Ground, creating catacombs. 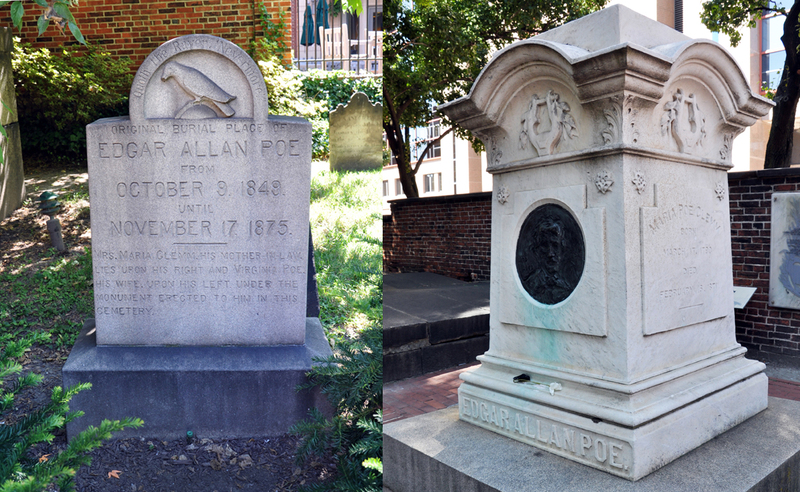 Edgar Allan Poe, his young wife and her mother all eventually found their final resting place within Westminster Burying Ground—each having been previously buried elsewhere—as did several early mayors of Baltimore, heroes of the American Revolution and members of the city’s elite. 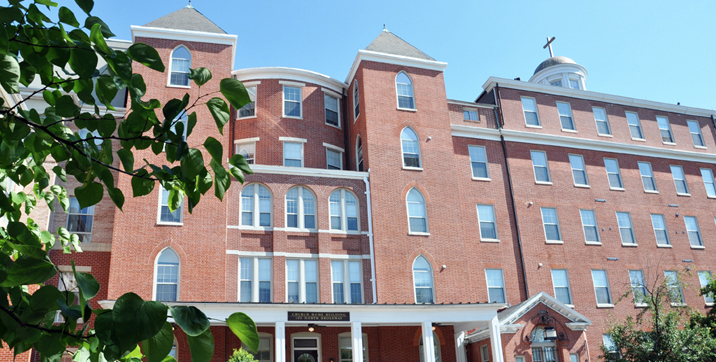 The church and burying ground are in the care of the Westminster Preservation Trust, Inc., a private, nonprofit organization established in 1977 under the leadership of the University of Maryland School of Law. 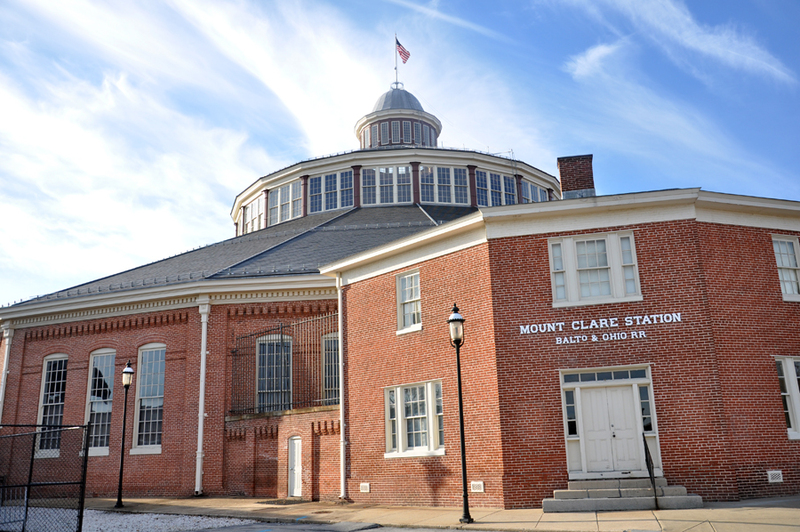 In 1983, the Trust completed a major project to preserve and restore the site’s historic features and to adapt the church building for contemporary use. Tours of Westminster Burying Ground and Catacombs can be arranged year round with a minimum of 15 people. Between 1949 and 2009, on the night of the anniversary of Poe’s birth, a mysterious stranger entered this cemetery and left as tribute a partial bottle of cognac and three roses on Poe’s grave. The identity of the stranger, referred to affectionately as the Poe Toaster, is unknown. The significance of cognac is uncertain as it does not feature in Poe’s works as would, for example, amontillado. The presumption for the three roses is that it represents the three persons whose remains are beneath the monument: Poe, his mother-in-law (Maria Clemm) and his wife Virginia. Out of respect, no attempt was made to stop or hinder him. Several of the bottles of cognac from prior years are on display in the Baltimore Poe House and Museum. The Toaster made his last visit in January of 2010, disappearing as mysteriously as he appeared, without explanation. Dedicated on January 19, 1934, the 125th anniversary of Poe’s birth. Intended to be a “living memorial to the great genius, who stimulated American literature.” It now functions as a meeting room, and contains an exhibit of letters, memorabilia, and a portrait of Poe copied from a daguerreotype by Thomas Corner. The collection includes a lock of Poe’s hair, a piece from his coffin and important letters regarding his mysterious death in 1849. The Pratt’s Collection of Poeana has been bolstered over the years by three major gifts from descendants of Poe. Click here to view the digital collection. The last work of the great American sculptor Sir Moses Jacob Ezekiel, it was commissioned in 1907 by the Women’s Literary Club of Baltimore. It was hoped that the statue would be ready by Poe’s centennial in 1909, but a series of problems prevented its completion until 1916 and World War I delayed its arrival in Baltimore. The statue was dedicated in Wyman Park on October 20, 1921. Over the years, it suffered from neglect, vandalism and the effects of wind and rain, which eroded the inscriptions until they were virtually unreadable. 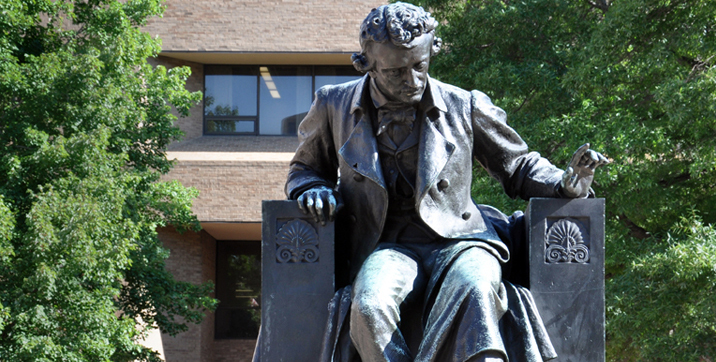 Deciding that the park was too isolated a location for the statue, it was moved, under the recommendation of the E. A. Poe Society Baltimore, to the plaza of the University of Baltimore’s Law School, where it now resides.